A macro shot of Black Cherry Soda reveals a sea of trichomes. They’re purple, magenta, creamy white and yellow, opaque and translucent. They come in a surprising array of colors, even though the naked eye might only see sparkly white. Yes, we’re talking about trichomes, the part of the pot plant where the cannabinoids and terpenes reside, which is responsible for making frosty nugs sparkle like dank little diamonds. Seeing them up close is like peering into an alien world you never knew existed. But this is not some radical DMT trip. This is photographer Shwale’s trichome collection and it is astounding. Macro photography has captured close-ups of cannabis trichomes for decades. But the images created by professional pot photographer Kale Worden – better known as Shwale – are stunning. He’s captured two-headed trichomes before even three-headed ones. He’s shot some that tower and then lean forward under the weight of their own bulbous heads. And he manages to capture their sparkling essence in a way that deserves high praise. 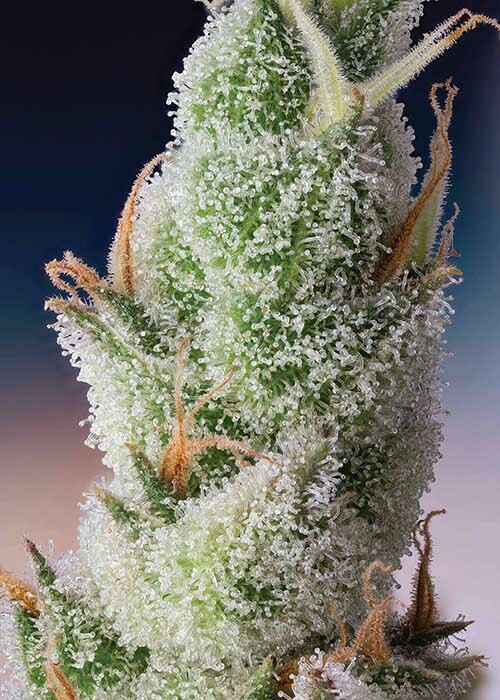 A foxtail of Silver Surfer reveals a sea of trichomes, the resinous bulbs on cannabis flowers that contain cannabinoids such as THC and CBD. One double-headed trichome that shares the body of a purple stalk looks like some underwater alien life form you’d see on “Blue Planet,” with conjoined bulbs for eyes that are not too dissimilar from the Cookie Monster — but actually on Cookies. From pink and purple stalks with creamy heads (or glands) to bright magenta trichomes protruding from green stalks and even multiple colors on a single trichome, Shwale’s photography produces some of the most fascinating images we’ve seen. Over 300 photographs of a trichome on a Sunset Strip strain are stacked together to produce one image. Inspired by Jason King’s “The Cannabible,” and having a lifelong interest in photography thanks to his professional photographer father, Shwale developed a love for cannabis and film early on. “I would actually sneak away with my dad’s expensive camera to similarly document the various ‘dank kind’ I was smoking in high school,” he says. Kruple Fantasy #1 from Farmhouse Studio. Getting shots that are so up close and personal is no easy feat, and can take several days and many long hours to achieve. For just one shot, Shwale, who mostly sources his material in-house from Denver’s Farmhouse Studio garden, must sometimes shoot 200-300 photos over several days, then layer (or “stack”) them to get the clear and up-close end result. Shwale titled this photograph “The Eternal Knot” as a reminder that everything is connected. And it’s just as incredibly tedious as it sounds. “Sometimes I’ll retake a shot over several days to get it right. Then we have hundreds of photos of one subject that need to be digitally stitched together, ” a process that can take anywhere from an hour up to several days. Editing the final photo adds another hour at minimum. “Yes,” Shwale confesses. “All of that for just one image of cannabis. But Shwale doesn’t just shoot cannabis trichomes. He’s also shot stunning trichome images from other plants, including a fuchsia trichome on a long-stem rose and striking opaque trichs with magenta heads on a hazelnut bush. Hash rosin, made from the strain Glue, glistens in the studio light. Currently, Shwale uses a Canon 6D body, “usually with the MP-E 65mm lens for extreme macros; sometimes a 100mm macro for wider cola shots.” As for flashes, he says, “The more flashes, the better.” He uses a 150-watt studio strobe and a macro twin flash. “A StackShot automated focusing rail is essential for large stacks,” he says. Finally, he employs a Manfrotto tripod for stability and says “concrete floors help with vibrations. For the hours and hours he pours into creating just one photograph, what exactly makes it all worth it? “A glimpse into the unseen,” Shwale says. “Today’s macro photography gives us a brand new view of the tiny world around us and the technology keeps getting better. And so does our understanding of the cannabis plant, enhanced as it is by peering into the secret and alien world of trichomes. Each trichome glistens in its own unique manner. TELL US, do you know what trichomes are? Beautiful photographs! We have found a method of extracting pure trichomes into a spray on tincture. It stops pain on contact including pain from arthritis, swollen joints, sprains…any type of pain. It is going crazy. We have people that literally need it so they can keep working. Some have started working again after using this Tincture. We also recommend the Holy oil. It is amazing as well. A miracle in fact. Cannabis belongs to We The People.